Inspired by one of our favorite warm soups, this hearty grilled cheese is a satisfying meal by itself. 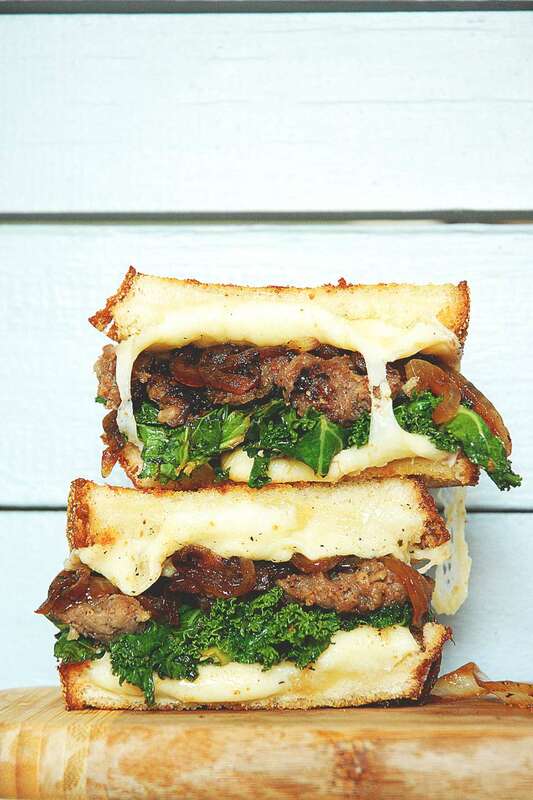 It combines spicy sausage, citrusy kale, savory caramelized onions and slightly tart Wisconsin kasseri cheese, which melts perfectly. We recommend serving it alongside a jammy Cabernet Sauvignon to help balance the saltiness of the sandwich. Remove casings from sausage, if necessary, and place in a medium skillet over medium-high heat. Break up sausage with a spatula and cook until browned and cooked through, but still, has some color. Remove from heat and set aside. Mix in kale with a pinch of salt and pepper and cover skillet until leaves begin to wilt. Remove from heat, add lemon juice, mix and set aside. Pile half of Wisconsin kasseri on 1 slice of bread and layer with kale mixture, sausage and remaining cheese, in that order. Place the second piece of bread on top and cover outsides of both bread slices with remaining butter. Grill sandwich in a pan over medium heat, turning once until both sides are golden brown and cheese has melted. Let sit this sandwich sit for 1 minute before serving – this will help the cheese thicken which helps the sandwich stay together as you're eating it.